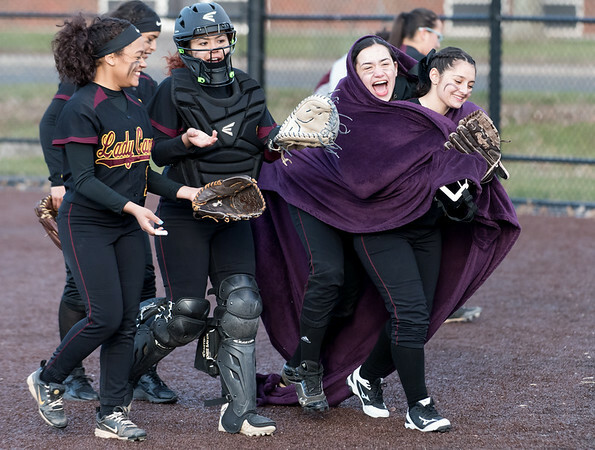 EAST HARTFORD - New Britain head softball coach Joel Simmone admitted Wednesday wasn’t the best game the Hurricanes had played this season, but it also showed how resilient they were. Joseleen Rivera pitched a complete game and struck out seven as New Britain beat East Hartford 6-5 for its seventh straight win. Of the five runs Rivera surrendered, only two were earned. Newington 6, Bristol Central 5: Cyan Gonzalez went 3-for-3 with a double and two runs scored while Rachel Thurston 3-for-4 at the plate during the Indians’ win over the Rams, claiming their spot in the Class LL state tournament. Savannah Jelm also went 2-for-3 on the afternoon, while Dani Pantano handled things in the pitching circle. Newington is now 8-9 on its season while Bristol Central drops to 9-10. Simsbury 1, New Britain 0: A pitchers’ duel ensued between Simsbury's Jack Donofrio and New Britain's Ruffino Santiago, but an early Trojans run was enough to squeak by with a win. New Britain struggled to get anything going on offense, only picking up two hits off of Donofrio. New Britain head coach Roberto Mercado highlighted Danniel Rivera as the lone bright spot on the team. "Rivera had a great game," Mercado said. "He was pretty much our whole offense." The loss drops New Britain to 12-6, while Simsbury improves to 12-5. Southington 9, NFA 1: The Blue Knights scored early and often in an easy win over Norwich Free Academy. Andrew Paradis and Jacob Weed had solid games on offense, each picking up two hits and two runs scored, while Weed drove in a run also. Christian Vargas had a double while Dylan Chiaro had a homer to help power the Blue Knight attack. Vin Gualtieri had the lone extra-base hit for NFA, getting a triple in the contest. Jeremy Mercier picked up the win fro Southington, while Tyler Briggs got the loss for NFA. The Blue Knights improve to 10-8, while the Wildcats fall to 6-12. Newington 199, New Britain 204: It was a match that came down to the final group. “[Newington’s] Jake Irons’ score pulled it out,” New Britain head coach Bob Zadrozny said. Irons shot a 48, tying with John Hurst for the Indians’ lowest scores of the afternoon. Hurricane senior Tim Carrier was the medalist of the match, finishing with a 47. He was followed by Johnny Morell (49), Arthur Bell (52) and Dylan Washington 56. Mike Hamill (50) and Cole Pratte (53) rounded out Newington’s top four. Goodwin Tech 208, Classical Magnet 224: It was a solid bounce-back showing for Goodwin Tech, topping Classical Magnet in convincing fashion. There were three medalists. Greg Taylor and Cole Bertrand from Classical Magnet, along with Jackson Collin, all posted scores of 49. Josh Donaghy, Brandon Keteorasmy and Logan Stine all added to the Goodwin Tech effort with scores of 51, 52 and 56, respectively. Newington 162, Middletown 171: Despite the rain, the Indians still managed to finish out their golf match. There were two medalist on the afternoon, one from each school, after Newington’s Jessica Pierzchalski and Middletown’s Logan Frame both shot a 36. The Indians were also led by Chloe Bilodeau (37), Taylor Kelly (40), Maddie Massaro-Cook (49) and Leah Tofldt (51). Newington 3, Wethersfield 0: It turns outs, the Indians will have to wait for some stronger competition after sweeping the Eagles with set scores of 25-19, 25-16 and 25-15. Dan Cloutier led the Indians with 32 assists. He also had nine digs and four blocks. Ted Fravel finished with five kills and six blocks, while Mason Romano tallied five kills and blocks; and Riley Miller finished with three kills and four blocks. Rocky Hill 4, Newington 3: Due to the weather, the Indians and the Terriers only played one game per match. Matt Utter and Ben Arora took home Newington’s singles wins. For doubles, it was the duo Josh Ellis and Lucas Klin. Posted in New Britain Herald, Goodwin Tech, New Britain, Newington, Southington on Wednesday, 16 May 2018 21:32. Updated: Wednesday, 16 May 2018 21:34.